James Naismith was a Canadian-born American who invented the game of Basketball. 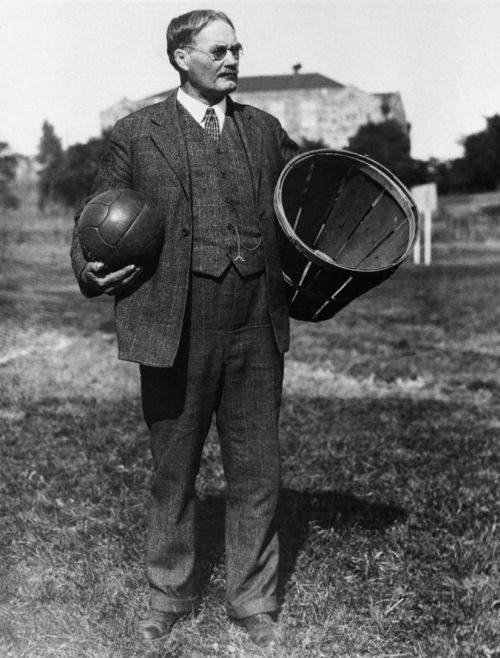 Naismith was born on November 6th, 1861 in Almonte, Ontario, Canada. Despite claims that his middle initial is 'A' he was never given a middle name. He was never a very good student in school. He excelled at working as farm hand and playing more physical games. In his youth his favorite game was called duck on a rock. In the game a player tries to protect a small object stood upright. The other players have to try and knock the object over. Naismith was very good at the game and used a light arching shot where some of his fellow players used a harder more direct shot. The light arching shot would become important in the development of Basketball. He graduated from Almonte High School in 1883. After graduating he enrolled in McGill University in Montreal, Quebec, Canada. He participated in several sports while at McGill before graduating with a Bachelor of Arts in Physical Education in 1888. After graduating Naismith became a physical education teacher. In 1891 he became the first director of Athletics at McGill. Before long he left Montreal for a job as the physical education teacher at the YMCA International Training School in Springfield, Massachusetts. It was at the Springfield YMCA that Naismith was met with a challenge. He had a class of rowdy young men, who, unable to go outside in the harsh winter, had become almost uncontrollable. Because of this Naismith's boss directed to come up with a new activity for the young men and gave him only 14 days to create it. The game had to be no contact as Naismith's boss did not want anyone getting hurt. Naismith looked at the popular games at the time including Baseball, Football and Lacrosse. To help with the idea that it should be a no contact sport Naismith decided to put the goals, two peach baskets that he attached to the railings, 10 feet about the gym floor. Initially people were allowed to move with the ball, this led to a variety of injuries since people just instinctively tackled the player with the ball. After the first round of injuries, Naismith made it that you could not move with the ball and the players had to strictly pass the ball. By 1892, the game was already gaining popularity, especially in YMCA facilities. There were calls for the game to be called Naismith Ball, Naismith refused that honor. By 1898, Naismith had moved to Denver and gotten himself a medical degree. Later that year he joined the University of Kansas faculty. There he became the head coach of the newly formed Basketball team. He was actually hired as physical education instructor. Ironically Naismith is the only coach in the history of the University of Kansas program to have a losing record. Despite inventing the game, Naismith was not all that interested in the game. He was more focused on teaching physical education. In 1925, Naismith became a United States citizen. This was after he traveled extensively in the United States and Europe. Naismith passed away on November 28th, 1939. Naismith was a member of Russell Lee Lodge in Springfield, Massachusetts. Later he affiliated with Lawrence Lodge No. 6 in Kansas. He was Worshipful Master of Lawrence Lodge from 1927 until 1928.